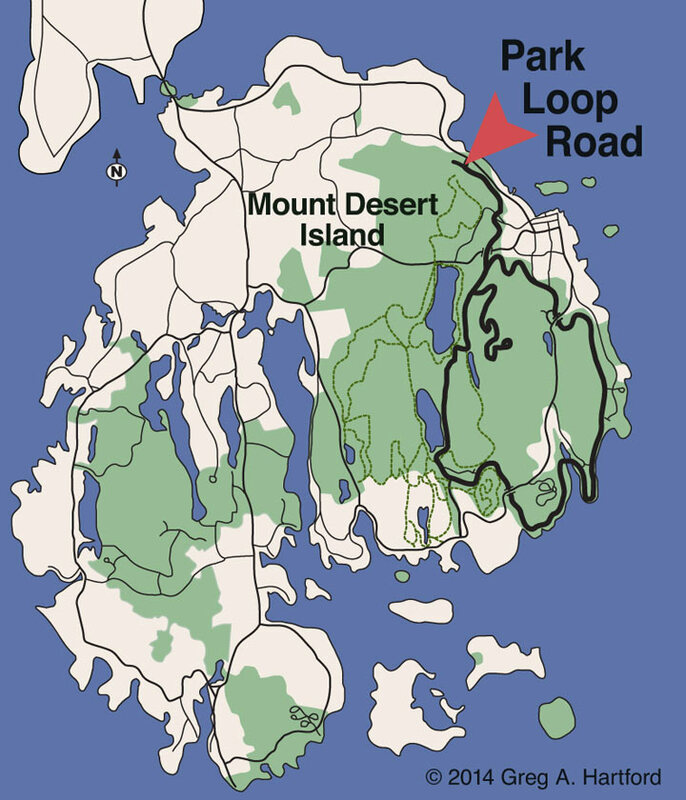 The 27 mile Park Loop Road is the primary avenue for navigating through Acadia National Park on Mount Desert Island by vehicle. It begins near the Hulls Cove Visitor Center on the north side of the island in Bar Harbor and connects the park's lakes, mountains, forests and rocky shores for easy exploration. You may also access it off Route 3 just south of Bar Harbor on the right just past Jackson Lab. Much of the road is one way but there is a two way section that begins near Wildwood Stables so keep this in mind. (GPS Coordinates for entry points are provided below.) A fee is required and may be paid at the Entrance Station located about one-half mile north of Sand Beach. Entrance Passes may also be purchased at the Visitor Center, Blackwoods and Seawall Campgrounds, the Bar Harbor Village Green, and the Thompson Island Information Center. There are special pull-off observation points along the thoroughfare as well as special parking areas such as at Sand Beach, Thunder Hole, Otter Cliff, and others, so take advantage of them. When traveling on the one-way section on the eastern side of Mount Desert Island, you may also pull over to the right side and stop or in the actual right lane itself. However, still use extreme caution when exiting your vehicle as another vehicle can appear at anytime. And don't be afraid to check out surrounding areas but always use caution whenever near the shore and especially when near the high cliffs. Construction of the roadway was a huge undertaking and one which began in 1922 and continued through the 1950's. It was partially financed by John D. Rockefeller, Jr., who was the father of the park's famous Carriage Roads. A large part of the beautiful and sensitive design, often taken for granted, is attributed to the talents of landscape architect, Frederick Law Olmsted, Jr., who artfully combined functional aspects of a road system with the indigenous landscape. Much of the physical labor that was required was provided by the Civilian Conservation Corps (CCC) beginning in 1933. This was a social program setup during the Great Depression by President Franklin Delano Roosevelt shortly after he was elected. The CCC planted many trees, and helped construct the Carriage Roads as well. One of the program's earliest camps that was set up for housing was near Eagle Lake and is currently used as the Park Headquarters. There are endless things to discover and appreciate here. Drive slowly as there is an abundance of wildlife. Deer often can be standing right next to the road, especially in the early hours, and you would not see them until you are right next to them. Enjoy the magnificent forests and plant life as well. One good place to begin your exploration is the Nature Center at Sieur de Monts Spring. This location holds special significance in the history and formation of this national treasure. Take your time, and feel free to contact the National Park Service with any questions that you may have. A Park Ranger is always happy to assist. In my opinion, the Park Loop Road on the eastern side of Mount Desert Island has more extraordinary sights per mile than any other place on MDI. The Cadillac Mountain Summit Road has many exceptional views as well. But when one considers the places that follow one after the other, the Park Loop Road seems to jettison ahead. As soon as the ocean is in view, these special spots begin with the Egg Island Lighthouse and Schoodic Peninsula to the East. Coming up on the right will be the Precipice. Beyond this, on the left just before the Park Entrance Station is a short road leading to Schoodic Head Overlook. Past the Entrance Station will be Sand Beach, The Beehive, the Ocean Path, Thunder Hole. Gorham Mountain, and Otter Cliff, all within sight of each other. Note: Even though the Park Loop Road is one-way here, there are a couple of other access roads to it. One is the Schoodic Head Road running from Bar Harbor south to the Overlook. The other is further down just before Otter Cliff on the right. 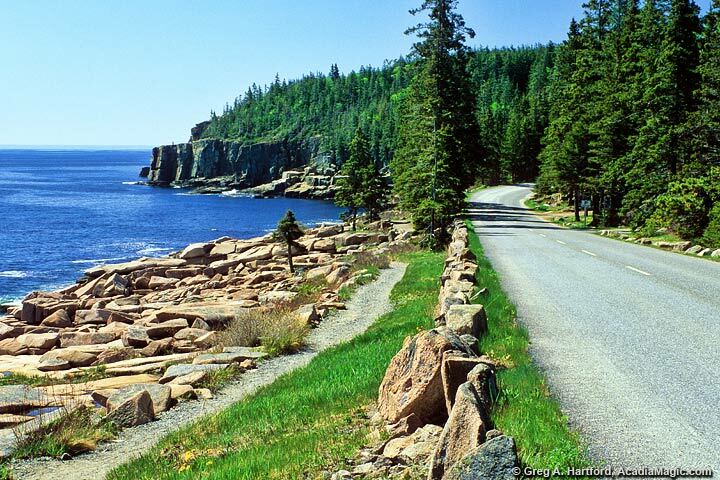 The Otter Cliff Road comes off Route 3 just South of Bar Harbor and continues in a southerly direction to Otter Cliff. Both of these are real handy to know about.